The Friends had been hearing the buzz about the new Italian restaurant, Farina, by chef-owner Nunzio Scardo, who also owns the Driftwood Southern Kitchen. Both are located in the Lafayette Village, off Falls of Neuse Road. 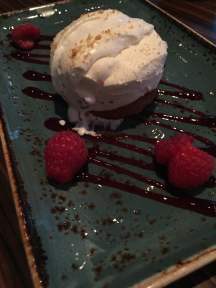 We loved the food, service and ambiance of the Driftwood and had high expectations for Farina. We loved their mission statement: Farina is a casual, neighborhood spot serving up delicious, handmade American-Italian fare. We want you to feel right at home dining with us. Don’t worry, we’ll even clean up and do the dishes. Enjoy a sampling of our small plates, a wood fired pizza, fresh handmade pasta or a glass of vino from our eclectic list. Dining with us should bring you right back to those Sunday family dinners at Nana’s. Saturday at 7pm, the restaurant had many open tables, which surprised us. 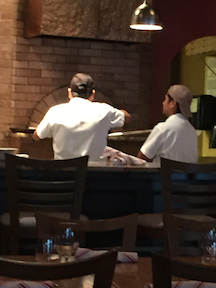 We always like speaking with the staff, and quickly learned the wait staff were employees of the previous Italian restaurant at this site. In fact, the Hostess referred to the restaurant by its previous name Paparazzi. She was not familiar with the menu and told us to speak with the waitress. This was a new menu, but management needs to train the wait staff appropriately. The waitress let us know that she had worked at Paparazzi as well. She had some familiarity to the menu and gave suggestions on what she had eaten. But through the course of the evening we learned the reason Farina charges $2.00 for their bread is that they wanted to save money. They had originally charged $3.00 but lowered the price. If they offered complimentary bread, they would have to charge more for the entrees. The room was very dark and there were no candles on the tables. I pulled out my handy IPhone flashlight in order to read the menu. 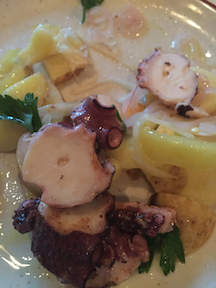 I started with the Octopus salad. It was expertly prepared and tasted lovely! Belle ordered the Baked Goat Cheese. 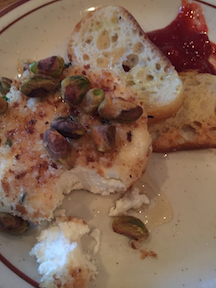 The goat cheese was ample and well prepared, but there were only two crostini’s on the plate. The ratio to the crostini to the goat cheese was unbalanced. We like to share our food, so Belle asked for more crostini. The waitress brought only one. She later told us that we should have requested a specific number of how many was wanted. I assumed they wanted us to pay the $2.00 and order bread. 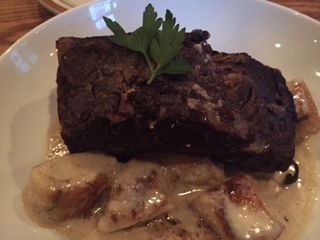 The waitress had raved about the braised short ribs, so I ordered it. I received one piece of meat that looked like a chunk of roast beef. I counted 10 undercooked gnocchi with little sauce. I could not find the Gorgonzola cheese in the sauce. 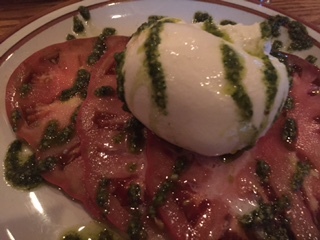 I also order ordered heirloom tomatoes with Barrata and vegetable pesto. This was my favorite part of the meal. 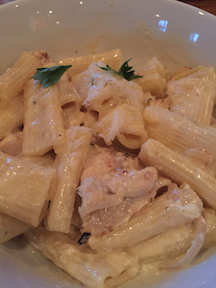 Belle ordered Rigatoni with grilled chicken, rosemary, goat cheese and parmesan cream. She felt it was too heavy and under season. 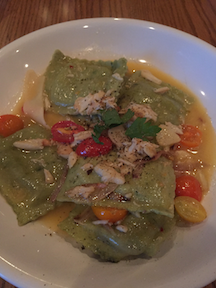 Badboy ordered Melina’s lemon cheese ravioli, topped with crab and heirloom tomatoes. Badboy found it delightful, although skimpy on the crab. He also ordered the chocolate and Nutella Tiramisu. He thought it was awesome. The manager was not circulating among the diners. Typically in a new restaurant you want to make your diners feel welcomed and appreciated so you chat with everyone, looking for input, feedback and critiques. The owner needs to look at what makes the Driftwood so successful and apply it to Farina. We support local businesses and wish Farina luck, but they have a lot of work to do to live up to the standards set by the Driftwood. Restaurant Week in the Triangle is the opportunity for local restaurants to showcase their food and what they have to offer perspective customers and their faithful followers. WRONG! 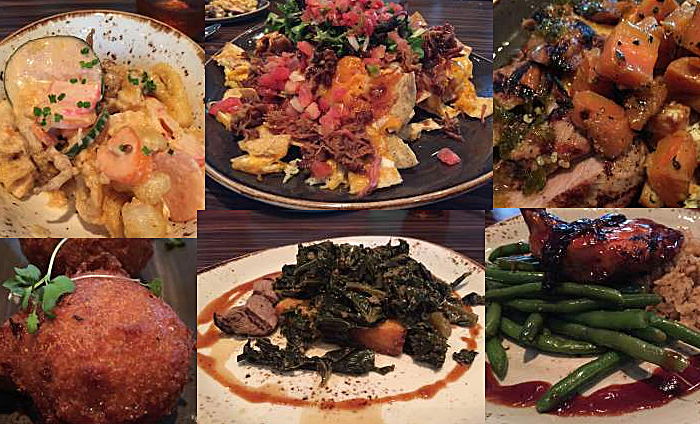 The three- friends made the mistake of selecting the Rye Bar and Southern Kitchen at the Marriott in Raleigh. We Ubered to Rye’s for our reservation. We were immediately seated and our waitress Katie was outstanding. She was polite, attentive and knowledgeable about the food on the menu. She told us they were trying new selections for the summer menu. The lightening over the table was wonderful. We decided, after studying the menu, to order the Sweet and Spicy Calamari and the NC Nachos to start. We typically share and sample the various dishes to make sure we are not biased on our review. Sweet and Spicy Calamari described as fried and tossed with house pickles and sweet chili aioli. It was definitely not what we expected. We were not sure the calamari was fried, because it was hard to identify in the serving vessel. After one bite it was placed to the side. We informed the waitress we did not like the dish. The Carolina Nachos were edible, but nothing special. Belle selected the BBQ Corn Waffle, described as smoked pork with honey-braised kale. It was difficult to eat due to being served on a single corn waffle, and because of the cloying sweetness. The ingredients did not marry well. The dish was also not eaten. For her entry, Belle chose the Heritage Farms Pork Skirt Steak with smoked pimento cheese grits, mustard glazed collards and jalapeno marmalade. The kitchen was accommodating by substituting chard carrots with honey and goat cheese for the collards. However there was no goat cheese to be seen and the carrots had no flavor. The pork was sweet and developed a bitter after taste. This entrée was not eaten as well. 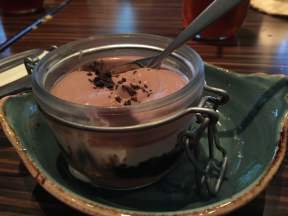 For dessert, Belle chose the chocolate jar, consisting of various layers of sweet chocolate, whipped cream and dark chocolate. It tasted good and was the only dish that was completely eaten. Badboy chose the Zucchini Fritter with Red Pepper jam. The fritter was raw in the center. It was inedible, and was left like so many samplings of the evening – to be taken away untouched. Badboy selected Honey BBQ chicken with dirty rice and green beans. He liked the flavor of the chicken and the green beans but felt the Dirty Rice was lacking in seasoning. He ate the chicken, leaving the rice. For dessert he chose the Lemon Ice Box pie. It was definitely the best dish of the evening. The lemon flavor was perfect! I selected the Fried Okra with Mustard Aioli. The fried okra lacked seasoning but since I was hungry, I ate, leaving the over powered Aioli behind. I chose the Heritage Farms Pork Skirt Steak with smoked pimento cheese grits, mustard glazed collards and jalapeno marmalade. The pork was sweet, but developed a bitter after taste – same as Belle’s. The collards were bitter as well. The pimento cheese grits were bland and tasteless. I did not eat the entrée. The waitress told the Supervisor, Caitlyn Walker, we had not been pleased with our meals. She was polite, listened to what we had to say. The waitress had checked with her to see if the Chef/General Manager would speak to us. Ms Walker told us that Chef Michael Rigot had gone home for the evening. Imagine our surprise when the Chef came to the nearby table to meet an employee’s family. After some prompting, we determined that he refused to talk to us. The waitress brought our bill and we paid. I asked to speak with the supervisor again. Instead the Restaurant Manager, John Herbert, came to our table. He referred to us as foodies, implying we were trying to get a free meal. He asked if he compted our meal, would this buy him a good review. I quickly informed him no, that we would write up the dining experience as it happened. He then told us that dining was a hit-or-miss experience and tonight for us it was a miss and to have a good evening. I have stayed at Marriott hotels, eaten in Marriott restaurants and stayed in Marriott resorts and have never experienced such rude and condescending behavior or the poor quality of food and customer service. We three friends will not be returning to Rye Bar & Southern Kitchen. I have contacted the Marriott Corporation notifying them of our horrible dining experience and have agreed to send a copy of the blog. While cooperate Marriott cares, Rye management has no concept of good customer service or satisfaction. Snap Pea Underground is the work of Chef Jacob Boehm, a Stanford University graduate who spent some time working for James Beard-award-winning chef Andy Ricker of Pok Pok in Portland, Ore. 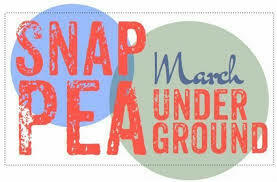 The name snap pea was thought up Chef Boehm on a run in East Palo Alto while he was living in the Bay Area. Chef Boehm states he developed his love of cooking out of his love of eating. 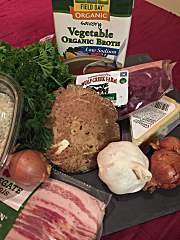 Additionally, in his family growing up, if you cooked, you didn’t have to clean!​ Much of his creativity is rooted in his mother’s creativity with ingredients that she had around, or ones that were on sale, or looked particularly good at market. He remembered one occasion during citrus season when Blood Oranges were super on sale, and she bought maybe 30lbs of them and we just went at them, making all kinds of things. I had the opportunity to meet his mother, and she was truly a delight. She is obviously very proud of her children and their accomplishments. Chef Boehm’s sister, Tova Boehm, has a company called Short Winter Soups. I enjoyed the Chef’s unique creations and hope you will want to experience this as well! I shared the evening with Laura who works at the Umstead Hotel, Carla and David from Chapel Hill, previous clients of Chef Boehm, Bruce and Nancy, Parents of the Chef, Leyla employee of the Chef enjoying dinner as a guest and Cathy, visiting Carla and David, childhood friends from Canada. They were great dinner companions, as we critiqued each course. The eight-course dinner will be held at a secret location near the N.C. Museum of Art in Raleigh. The specific address will be emailed to the attendees 36 hours beforehand. The dinner is BYOB. The dinners start at 7 p.m. and last about three hours. Time: Please arrive between 6:30-6:45 to grab seats (and pop open your wine). Dinner will start promptly at 7PM and last around 3 hours. Location: RAC (Raleigh Arts Collective) 500 Royal St, Raleigh, NC 27607. Please park on the street or to the right of the building. Unlimited Hall Pass (1-month): $120. Gives you access to the shop to use all the tools and have all the fun for a full month. Seven days a week, open to close. Day Pass: $20. Gives you all day to play with full shop access, from open to close. Three-Day Pass: $40. Gives you full shop access for any three days of your choosing, from open to closing. RAC Pass (1-year): $1000. Gives you full access to the shop for an entire year. It’s like everlasting recess!! RAC Hack Pass: $50. Gives you access to shared floor space to work on computer-related projects, hacking, Arduino, robotics or whatever else you can think of for a full month. No access to any shops. We offer a 20% discount for students (with valid ID) and seniors for all monthly memberships. Group discounts also available. Steelmaking is the process for producing steel from iron and ferrous ores and scrap. Chef Boehm created his concept of creating his menu from the process of making steel due to the industrial feeling of the RAC space. In my continuing series of pairing food trucks with local breweries, I have chosen to sample King’s Authentic Philly with Nickelpoint Brewing Company. As random as some of these pairings might seem, I selected this one because the Traveler had met Nicklepoint’s co-owner, Shaluka Perera, at a recent Competition Dining Event the previous week, where Nicklepoint Brewing exhibited several of its crafted beers for those fortunate enough to attend. Shaluka seemed eager to grant us at Triangle Street Eats, unadulterated access to his establishment, for the purposes of this informative write-up. The name ‘Nickelpoint’ loans itself for the nearby neighborhood of Five Points, to which it is located at 506 Pershing Rd, Raleigh. This location provided Nickelpoint with a convenient location for nearby residents, as well as opportunity to grow and expand. They are currently a 20-barrel microbrewery. Bruce Corregan, Nickelpoint’s other co-owner and brew master, told us about how they plan on developing a canning operation in the foreseeable future. He also express that he would be developing new and original brews for thirsty patrons to enjoy – pushing the envelope of creativity and diversity as it relates to brewing. One of the more interesting aspects I found of Nickelpoint was that Bruce’s son, Braeden, was working to develop soft drinks – currently root beer and an orange-cream soda – to offer to patrons as well. Belle and I sampled these, and found them to be unique and outstanding. I hope that young Braeden continues to develop original flavors for Nickelpoint’s growing fans and followers. After looking over the food trucks that frequent Nickelpoint, I had decided that King’s Authentic Philly would be my choice of fare for this pairing. Especially when you consider that I had yet to experience their spin on this remarkable sandwich, which is a Philly staple. Once I had made my pairing, and tweeted-out about my next adventure, I got an immediate response from King’s Authentic Philly to pair Nickelpoint’s Vienna Lager, with their Smokin’ Joe Frazier. The pairing of a hearty, handcrafted lager and a rendition of a classic Philly Cheesesteak sandwich with jalapeño peppers and Pepper Jack Cheese? It was like they knew me – how perceptive! We met the owners of King’s Authentic Philly, John and Barbra Kingston, and found them to be dedicated and friendly, with a passion for food in general, and obsessed with all things Philly…especially cheesesteak! Belle sampled the ‘Philly’ a more traditional version of the classic Philly, with Provolone cheese. The sandwiches were outstanding, with ample heat from the jalapeño peppers and pepper jack cheese for my Caribbean-based palate, which I extinguished between bites with the Vienna Lager. This experience was warm and friendly. 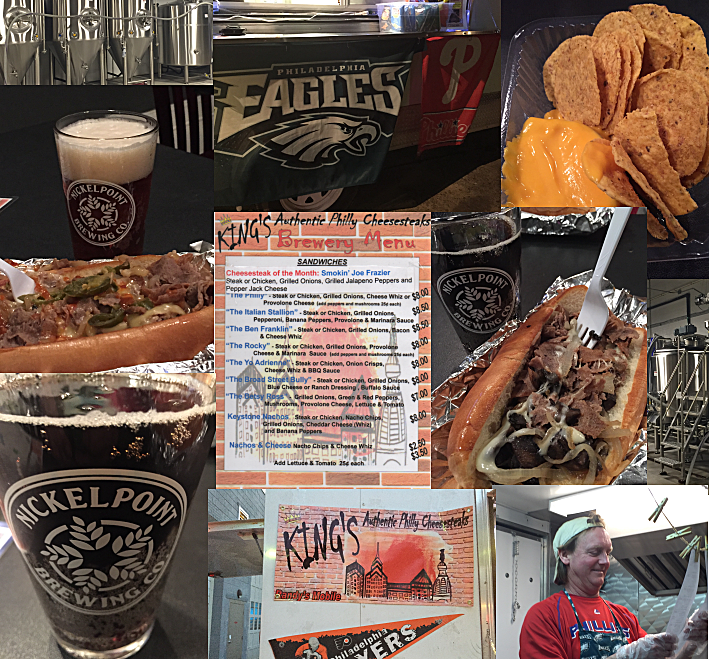 You can enjoy Kings Authentic Philly for every first and third Wednesday at Nickelpoint Brewing for yourself. 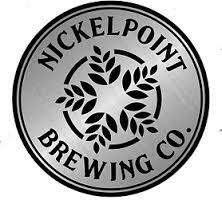 I feel that I should mention that there are a few events scheduled for Nickelpoint Brewery that involve beer pairing. The first, celebrating NC Beer Month, will be hosted by Manna, another food truck that frequents Nickelpoint’s establishment. This event will be held on April 6th, from 7 to 9pm. Go here to get more information and tickets. Also, Nickelpoint has planned a beer pairing with Midtown Grille for sometime in April as well, but as of posting, the details have not been made available. Stay Hungry My Friends…Badboy. How it works: Paying guests get to sample each course in a blind tasting alongside a panel of culinary and celebrity judges in a series of 15 dinner competitions hosted in the four regions of the state. Each evening, two restaurants “battle” it out side-by-side in a single elimination format. Guests savor a six-course menu (three dishes from each chef without knowing whose food they’re tasting) created around a “secret” ingredient. For almost all series, the secret ingredient will come from a North Carolina source. The secret ingredient is revealed to the chefs only an hour before they start cooking and it must be used in each of their three courses Diners, alongside culinary and guest judges, will rate each dish and determine who moves to the next round and who goes home. Semi-Final Round – both chefs had competed and won in the first round of competition. Contestants: Chef Ryan Conklin CEC from Rex Healthcare and Chef Curt Shelvy of Curt’s Cucina. At stake is a grand prize of $2,500 and a coveted red chef jacket. The winner was Chef Ryan Conklin CEC of Rex Healthcare with a score of 25.975 over Chef Curt Shelvy with a score of 25.674. Conklin took home a $2,000 cash prize, a handmade chef knife by Ironman Forge and the coveted “Red Chef Jacket” provided by ALSCO. Additionally, the Rex Healthcare team moves on to the final battle of champions in October where they will compete against the winners from each of the other North Carolina tournaments. Contestants: Chef Christopher Hill of Faire and Chef Ryan Conklin CEC from Rex Healthcare At stake is a grand prize of $2,500 and a coveted red chef jacket. North Carolina Egg Association Representing NC Farmers. Egg production is an important segment of the agriculture industry in North Carolina. 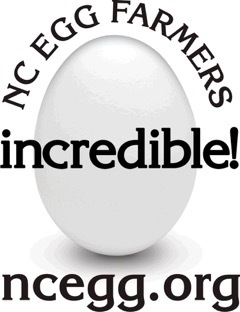 The Egg Industry ranks 7th in North Carolina commodity receipts. Our egg farmers are located all over the state from Dare County to Cherokee County. We have approximately 9 million birds which lay about 7 ½ million eggs a day. That is about one bird per person North Carolina. And since the average person eats about 255 eggs per year, we produce enough eggs to feed our residents. Hens lay an egg about once every 26 hours and usually skip a day in the week. Poplar Ridge Farm is a North Carolina Organic Certified Farm Established in 1995 – Owner/Mgr Marianne Battistone – Contrib Expert SELF Magazine since 1980. Poplar Ridge Farm is a Certified Organic Community-Supported Agriculture (CSA) farm offering produce & flower memberships, weekly online orders, an open to the public on-farm market stand, and deliveries to Charlotte metro restaurants. A sunchoke is a tuber, like a potato, and is often prepared and eaten as a root vegetable. Light brown and bumpy on the outside and white inside, the sunchoke looks somewhat like a small potato or ginger root. It is native to North America and was cultivated by Native Americans prior to the arrival of European settlers. 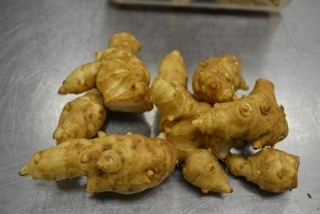 Also called a Jerusalem artichoke, its name can be a source of confusion because the plant is not closely related to the artichoke; rather, it is a member of the same flower family as the sunflower. With a nutty, somewhat sweet flavor, many cooks enjoy adding bits of the crunchy, raw vegetable to salads or salsas, while others prefer them roasted or mashed. 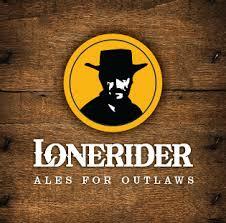 Topo Distillery, LoneRider Brewery and the North Carolina Beer Guys supplied drinks. I loved my spicy Bloody Mary again last night. While we were waiting a basket of bread supplied by La Farm Bakery was placed on our table. Ymm! Belle enjoyed her Shotgun Betty Hefeweizen. Table 13, a change from my favorite table #4, consisted Linda Barnes, Belle of Triangle Street Eats, Lisa and Jeff, Katey and Matt, John and his date, Christy and Cole and myself. Everyone was excited to be at the dinner. Lisa and Jeff had attended the competition with cocoa nibs. Katey and Matt recently had a baby girl, and were on a date celebrating their anniversary (wink wink) and Linda was celebrating her birthday. They received glasses from Libbey. The winner was Chef Ryan Conklin CEC of Rex Healthcare with a score of 28.14 over Chef Christopher Hill with a score of 24.47. It was a battle to the end, who both chefs preparing an outstanding culinary experience, Conklin’s Chocolate Ice cream was the winning course that pushed his score over the top. 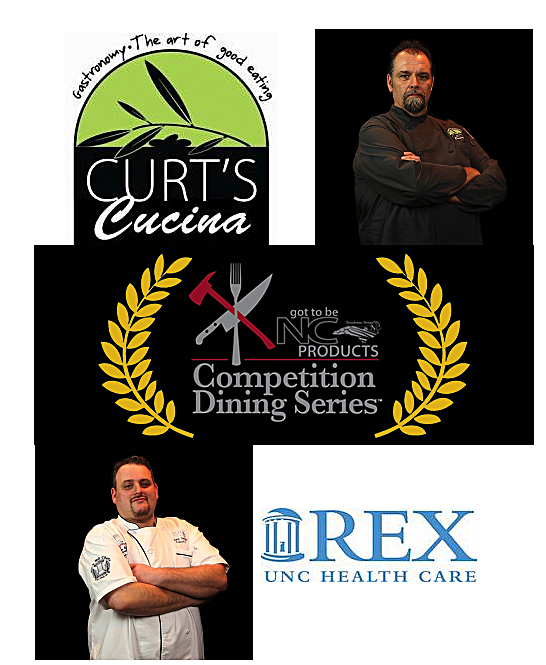 The final battle will be between Chef Ryan Conklin of Rex Healthcare and Curt Shelvey of Curts Cucina on March 9. It will be a great competition between two great competitors! Relay Foods is an innovative online grocery company with a mission to bring the best in local produce, sustainable foods and everyday groceries directly to their customers. Relay offers about 8,000 products in their catalog; 30% of the catalog is sourced locally to the markets they serve. With simple online ordering and convenient home delivery or free pick up, Relay Foods is changing the way people get their groceries, simplifying the process and raising the standards for local quality. Launched in Charlottesville, VA in 2009, Relay Foods has quickly grown to serve much of Virginia, Washington, D.C., and Baltimore metro areas. Now they are growing their market in the Triangle Area with pick-up sites in Raleigh, Durham, Chapel Hill, Morrisville and Cary. The Friends discovered Relay Foods at Pop-Up Sunday Market and signed up for their promotional offer. We were very pleased with our first experience and found Relay Foods to be a dynamic online grocery company. First we “shopped” at Relay Foods online from our home computer (you can also use you mobile device). After our cart was filled, our order was hand bagged, making sure of freshness, cleanliness and accuracy. It was then placed on one of the Relay trucks to be delivered at one of the many pick up spots. Recently Relay Foods has added a new meal planning service that takes the ease of shopping with Relay one step further. With the meal planning, you can shop by meals rather than individual ingredients. There are several different meal plans with 3-4 meals in each plan. You can pick and chose meals from different plans, making menu planning a snap! For now, this service is still in beta mode; that means Relay is giving customers access to it in small groups. Relay Foods reached out to The Friends to see if we would like to participate in the beta testing. We were excited and happy to take part in this. We planned to do this for one of our Saturday at-home-dinners. Last weekend, Traveler and I tried out one of the meals from “Flavors to Fall in Love With” meal plans. 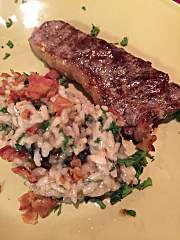 Traveler selected the Simple Strip Steak with Mushroom Bacon Risotto meal. Relay Foods home delivery service brought our order right to the door late Friday afternoon. I could hardly wait to unpack our order see what we had to work with. I unpacked our groceries to take an inventory making sure we had everything called for in the recipes. After verifying we had everything needed, I put it away. 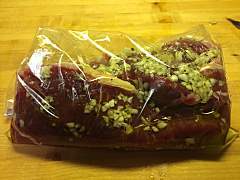 When Traveler arrived Saturday afternoon, we reviewed the recipes from the Relay meal plan and made our game plan for the Simple Strip Steak with Mushroom Bacon Risotto dinner from Relay Foods. Since the steak needed to marinate for at least 2 hours, we made the simple marinade of olive oil, garlic, salt and pepper, rubbed it on the steak and set it aside to rest for two hours. Using simple seasonings enhanced the rich pure flavor of this great steak. According to our game plan, Traveler would take pictures and tweet out our prepping and cooking of the meal. 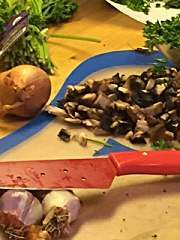 Since the Mushroom Bacon Risotto would take longer, I would prep for and cook the risotto so Traveler would have time to do plenty of tweeting. As I finished up the risotto, Traveler would prepare the Strip Steak. Our planning and timing of meal prep and cooking was spot on. Both the steak and risotto came off at the same time and we plated a very eye-pleasing meal. We found the meal to be as tasty as it looked. Traveler and I enjoyed our experience with Relay’s Meal Plan. Shopping by meals rather than individual ingredients is very convenient. You don’t have to worry about finding out you have forgotten something when you begin to prepare the meal because Relay’s Meal Planning has taken care of this. We found the recipes easy to follow using simple cooking techniques to complete a delicious meal. Traveler and I recommend giving Relay Foods Meal Planning a try. It’s great for busy people on the go.